The extended family has long played a role in caring for children whose parents were unable to do so—a practice commonly referred to as kinship care. Over the last decade, child welfare agencies have increasingly relied on extended family members to act as foster parents for children who have been abused or neglected, yet very little information is available on the extent to which kin serve as foster parents and how this practice varies across States. In addition, it has been difficult for Federal and State policy makers, as well as advocates and practitioners, to evaluate how well kinship care ensures children’s safety, promotes permanency in their living situations, and enhances their well-being—three basic goals of the child welfare system. Nonetheless, both Federal and State governments continue to implement kinship care policies—both explicitly and implicitly. permanency plans for children in kinship care. In its broadest sense, kinship care is any living arrangement in which a relative or someone else emotionally close to the child takes primary responsibility for rearing a child. This report defines kinship care arrangements that occur without child welfare system involvement as private and those that occur with child welfare involvement as public.2 Traditional foster care arrangements are referred to as non-kin foster care. This report expands upon Congress’ request for information on public kinship care in two significant ways. First, it provides information on private kinship care, when available, because policy changes regarding public kinship care are likely to affect private care. Second, to provide a deeper understanding of kinship care, it compares the policies covering public kinship and non-kin foster care and describes the characteristics and experiences of families in each group. Two Federal policy agencies—income assistance and child welfare—govern kinship care. Each has a different view of the role of relatives in caring for children. Income assistance policy—namely, Aid to Families with Dependent Children (AFDC)—treated certain relatives as an extension of the family and allowed them to include the children in their care in applications for income assistance, whether for family or child-only grants. However, the Personal Responsibility and Work Opportunity Reconciliation Act of 1996 ended the entitlement to income assistance for all AFDC recipients, including relatives, through the creation of the Temporary Assistance for Needy Families (TANF) program. The law also imposed new work requirements and time limits on TANF recipients, including some kinship caregivers. A State can choose to exempt kinship caregivers from individual work requirements, but these caregivers, if receiving assistance on their own behalf, must be included in the State’s overall work participation rate. This rate determines whether the State is subject to a penalty and a reduced TANF grant. In contrast, Federal child welfare policy historically overlooked the role of kinship caregivers and if States provided assistance to kin they did so through income assistance programs, effectively keeping them out of the child welfare system. As States began to rely on relatives to serve as foster parents, they often applied existing Federal foster care licensing, supervision, and permanency planning requirements— designed for non-kin foster parents—to kin caregivers. More recent Federal policies have acknowledged the unique circumstances of kinship care and have encouraged States to consider giving preference to relatives when placing a child in foster care. While the information in this report is the best available, generalizations and comparisons across States are problematic, for a number of reasons: differences in State policies and practices, differences in the types of kinship care cases included in State data, lack of representative data, inconsistent comparison groups, and possible correlations between kinship care and other, unmeasured variables. In addition, there is insufficient information available to assess the effects of kinship care, especially on abused and neglected children and on providers. The reader should therefore be cautious in interpreting the findings presented below by issue. In 1998, approximately 2.13 million children in the United States, or just under 3 percent, were living in some type of kinship care arrangement. In 1997, approximately 200,000 children were in public kinship care, well below 1 percent of all U.S. children but 29 percent of all foster children. Available evidence suggests that public kinship care has increased substantially during the late 1980s and 1990s (see Chapter 1). Three main factors have contributed to this growth. First, the number of non-kin foster parents has not kept pace with the number of children requiring placement, creating a greater demand for foster caregivers. Second, child welfare agencies have developed a more positive attitude toward the use of kin as foster parents. Today, extended family members are usually given first priority when children require placement. Third, a number of Federal and State court rulings have recognized the rights of relatives to act as foster parents and to be compensated financially for doing so. Insufficient data are available to assess accurately the costs and funding sources of public kinship care. It is possible to document State policies for financing kinship care but not, for example, how many families actually receive foster care payments, TANF grants, or other public assistance (see Chapter 2). Public and private kinship caregivers are much more likely than non-kin foster parents to receive public benefits because of their own economic status (Chapter 3); however, public kinship caregivers are less likely than non-kin foster parents to receive services from child welfare agencies (Chapter 4). With limited Federal guidance, States’ child welfare policies have developed in a manner that treats public kinship care differently from non-kin foster care (see Chapter 2). Almost all States (48 and the District of Columbia) give preference to relatives when placing a child with someone other than his or her parents, and most have been doing so for more than five years. In addition, many States (19 and the District of Columbia) have a broad definition of kin and include persons with emotional ties to the child, such as godparents, neighbors, and family friends. All but three States allow kin into licensed foster care programs designed for non-kin and provide foster payments to those who meet program standards. In addition, 41 States and the District of Columbia have at least one alternative foster care licensing standard for kin, and 22 States and the District of Columbia provide foster payments to kin meeting such standards. The remaining States support public kinship providers with TANF or other payments that are generally lower than foster care payments. Kinship care families differ from non-kin foster families in several ways (see Chapter 3). Kinship caregivers usually receive little, if any, preparation for their new role. Public and private kinship providers are older, more likely to be single, more likely to be African American, and more likely to have less education and lower incomes. They are more likely to receive public benefits. Public kinship providers are less likely to report being in good health. Children in private kinship care appear to be older than children in non-kin foster care, while children in public kinship care appear to be younger. Children in public kinship care are much more likely to be African American and appear to have fewer physical and mental health problems than children in non-kin foster care. The circumstances leading to placement in a foster home appear to be somewhat different for children in public kinship than for those in non-kin care. Children in public kinship care are more likely to have been removed from their parents’ homes because of abuse or neglect and are less likely to have been placed in foster care because of a behavioral problem or conflict with a parent (Chapter 3). The parents of children in public kinship care are more likely to have a drug or alcohol problem and are more likely to be young and never married. Child welfare caseworkers appear to provide less supervision and monitoring and fewer services to public kinship caregivers and children than to non-kin foster families (Chapter 4). Moreover, public kinship caregivers request and receive fewer services for themselves and for the children in their care. Overall, birth parents of children in public kinship care are offered and receive similar services as birth parents of children in nonkin foster care. Few studies have examined whether the needs of public kinship caregivers, the children in such care, or the birth parents of these children differ from those in non-kin care. Children in public kinship care maintain closer ties with their birth parents and their siblings than do children in non-kin foster care (Chapter 4). Research shows that birth parents and siblings visit children in public kinship care more frequently than children placed with non-kin foster parents. Birth parents also appear to be more likely to call, write, or give gifts to their children in public kinship care. Some experts have raised concerns about the safety of such children, especially because parental visits are often unsupervised, in contrast to parental visits to children in non-kin foster care. However, there is insufficient information to determine whether the concerns are warranted. The most common goal of child welfare agencies for children in both kinship and nonkin foster care is permanent reunification with their birth families. However, some data suggest that permanency plans for children in public kinship care are more likely than those for children in non-kin foster care to have reunification as their goal, while other data suggest the opposite (Chapter 4). Plans for children in kinship care are less likely to include adoption and more likely to include placement with a relative as their goal. In addition, outcomes for children in public kinship care appear to be different from those of non-kin foster children. Children in public kinship care are less likely to have multiple placements, tend to remain in out-of-home placement longer, and are less likely to be reunified with their parents. Despite the widespread use of kin as foster parents, many questions and concerns remain regarding this practice. States have been struggling to determine how to use kin most effectively, including how and to what extent they should treat public kinship care arrangements differently from non-kin foster care placements. Moreover, State child welfare officials and other experts have questioned whether existing Federal policies, developed almost entirely with non-kin foster care in mind, are appropriate for kinship arrangements. Traditionally, when child welfare agencies found it necessary to remove children from their parents’ homes due to abuse or neglect, they placed them in the homes of foster parents who had no prior relationship to the children or the children's family. Over the last decade, however, these agencies have increasingly relied on kin—that is, persons related to or having some prior relationship with the children—to act as foster parents. This practice is commonly referred to as kinship foster care. States’ use of kinship foster care has increased rapidly, but State and Federal policies have not always kept pace. Very little information is available on how well such care meets the basic goals of the child welfare system: to ensure a child's safety, promote permanency, and enhance well-being. In October 1998, the Kinship Care Advisory Panel met to discuss an initial draft of this research review. A second draft, which incorporated comments made during the October meeting, as well as written comments submitted by panel members after the meeting, was provided to the Advisory Panel for comment following its January 1999 meeting. This Report to Congress on Kinship Foster Care summarizes everything that is currently known about the use of kin as foster parents. Moreover, the report expands upon the congressional request in two significant ways. First, it provides information on the rearing of children by extended family members outside the child welfare system (commonly referred to as informal kinship care), because policies developed for formal kinship care may affect informal kinship care as well. Second, to provide a richer context for understanding both kinds of kinship care, the report compares the policies governing kinship care and traditional foster care and describes the characteristics and experiences of families in each group. It is important to note that while there is a growing body of research on kinship foster care, data are still severely limited. (Appendix B includes all State kinship care data 1 currently available.) Much of the information presented in this report is based on small-scale studies whose findings may not necessarily apply to the entire kinship population or even to other states or localities. Therefore, while the report summarizes the findings of recent studies, readers should be cautious in interpreting those findings. Chapter 1 discusses the role of extended families in helping to rear children, with or without the involvement of child welfare agencies.2 In addition, it documents trends in the prevalence of kinship care and identifies possible reasons why States have increased the use of kin as foster parents. At the same time, it highlights the benefits attributed to, and the concerns raised about, kinship foster care. Chapter 2 traces the development of kinship care policies at the Federal and State levels and their implications for caregivers. Chapter 3 describes the characteristics of kinship care providers and children, including demographics, income and education, reason for becoming involved in the child welfare system, and measures of health status and social well-being. Chapter 4 documents the experiences of children in kinship foster care during and after their placement. Finally, Chapter 5 summarizes the findings from the previous chapters, identifies questions that remain unanswered, and identifies potential sources of kinship care information. a review of existing bibliographies on kinship care. Appendix C provides a bibliography of all kinship care–related material used in the development of this report. In addition, this report incorporates comments made on earlier drafts by members of the Kinship Care Advisory Panel, as well as comments by members during Advisory Panel meetings in October 1998 and January 1999. Appendix D includes a list of Advisory Panel members. In its broadest sense, kinship care is any living arrangement in which a relative or someone else emotionally close to the child takes primary responsibility for rearing a child. Most kinship care takes place without the involvement or knowledge of child welfare officials. Such arrangements are not a new phenomenon. Anthropologists have documented the role that extended families play in raising children in cultures and communities around the world (Korbin, 1991; Young, 1970). Extended family members and other persons with a bond to the family have been particularly important in African American families dating back to slavery times, when parents and children were often separated. In fact, the phrase “kinship care” was coined by Stack (1974) in work documenting the importance of kinship networks in the African American community. In contrast, child welfare agencies’ reliance on kin to act as foster parents is relatively new. When the Adoption and Child Welfare Act of 1980 was passed, forming the basis of the Federal foster care program, it was very rare for a child's relative to act as a foster parent. Today, child welfare agencies increasingly consider kin as the first placement choice when foster care is needed and kin can provide a safe home. In examining how Federal policies have evolved to include kin, it is important to understand how and why the child welfare system grew out of, and has been intertwined with, income assistance policy. This history illustrates the ongoing debate over the appropriate public response to child poverty, including when to remove poor children from their parents’ homes. It also explains why Federal support for foster care, including kinship foster care, is tied to the income of the foster child’s own parent or guardian and why the role of kinship networks has been particularly important in minority communities. Only recently has Federal child welfare legislation begun to acknowledge the role and unique circumstances of kin acting as foster parents. In the meantime, States have had some latitude in applying Federal child welfare policies designed for non-kin foster families to kinship foster families and considerable latitude in determining how to serve kin not receiving Federal foster care benefits. Chapter 3 How Do Kinship Families Differ from Non-Kin Foster Care Families? ​These differences suggest that the needs of kinship caregivers and children may differ significantly from those of non-kin foster families and have implications for how child welfare agencies evaluate, serve, and monitor kinship care arrangements. Given the differences in their circumstances and characteristics, it is not surprising that the experiences of public kinship care families differ from those of non-kin foster care families. Specifically, it appears that child welfare caseworkers treat public kinship care families differently than they do non-kin foster families. They provide less supervision, less monitoring, and fewer services to kinship care families. In addition, the experiences of children while in public kinship care differ from those of non-kin foster children. Children in public kinship care maintain closer ties with their birth families, are less likely to have multiple placements, tend to remain in out-of-home placement longer, and are less likely to be reunified with their parents. While concerns have been raised about the safety of public kinship care arrangements, there is insufficient information to assess whether these concerns are warranted. There is virtually no information on how placement in public kinship care affects the long-term health and well-being of children. Public kinship care increased significantly in the 1980s and 1990s and now represents a significant portion of the nation's children in foster care. Kinship care, both public and private, appears to be very different from non-kin foster care, and States have developed policies to address the specific needs and circumstances of public kinship caregivers. In addition, child welfare workers appear to treat kinship care families differently than they do non-kin foster families. This may not be surprising, since the characteristics of kinship care families are significantly different from those of non-kin foster families. Finally, the experiences of children in public kinship care appear to be different from those of children in non-kin foster care. The extent to which children in foster care are placed with relatives. In 1998, approximately 2.13 million children in the United States (or just under 3 percent) were living in kinship care. While data are limited, it appears that in 1997, approximately 200,000 children, or 29 percent of all foster children, were in public kinship care. Available evidence suggests that public kinship care has increased substantially during the late 1980s and 1990s. State child welfare policies. As States began to use kin as foster parents, they developed varying policies for how to treat them. As a result, kin involved with the child welfare system are generally defined, licensed, supervised, and paid differently from non-kin caregivers. Specifically, 19 States broadly define kin to include godparents, neighbors, or other persons who have a bond with the child. Almost all States give preference to kin over non-kin in deciding where to place a foster child. In addition, 41 States waive standards or have less stringent requirements for kin who serve as foster parents, and 22 of these States pay kin the foster care rate. Finally, most State policies indicate that custodial kinship care (care of children in State custody) is supervised as rigorously as non-kin foster care. Characteristics of kinship caregivers. Kinship caregivers usually receive little, if any, advance preparation for their role. Agency-involved and private kinship caregivers are often constrained by limited decision-making authority. Both public and private caregivers are older, more likely to be single, and more likely to be African American. Public kinship caregivers are also more likely never to have married, to be the only adult in the household, and to take care of fewer children. Kinship caregivers' homes are more likely to be in central cities, largely because African Americans are concentrated in these areas. Both public and private kinship caregivers are likely to have less education and lower incomes than non-kin caregivers and are more likely to receive public benefits. Public kinship caregivers are less likely to report being in good health and are more likely to experience economic hardship. Characteristics of children in kinship care. Children in private kinship care are older than children in non-kin foster care, and children in public kinship care are younger than children in non-kin care. Children in public kinship care are much more likely to be African American, to enter the child welfare system because of abuse or neglect rather than other family problems, and to come from homes in which the parent had a drug or alcohol problem. However, children in public kinship care appear to have fewer health, mental health, educational, and behavioral problems than children in non-kin foster care. Caseworkers' practices. Compared to non-kin foster parents, public kinship caregivers have less interaction with caseworkers and receive less supervision and information about their responsibilities and the role of the child welfare agency. Public kinship caregivers and children receive fewer services, though it is uncertain whether this reflects differences in needs, knowledge about, or access to such services. Birth parents of public kinship care and non-kin foster children receive similar services. Experiences in care. Public kinship care allows children to maintain a greater sense of family continuity. Given the limited research available, it is not possible to assess whether concerns regarding increased risk to children in public kinship care are warranted. Children placed in kinship care remain in care longer and are much less likely to move from foster home to foster home than non-kin foster children. However, children in kinship care are less likely to be reunified with their birth parents. There is virtually no information on the long-term effects of kinship care on children's well-being. See Chapter 5 for a complete discussion of data limitations. Throughout this report, we differentiate between these two types of arrangements. When we wish to discuss both types of arrangements together, we refer to them as simply kinship care. Takas used similar terms to differentiate kinship care arrangements, but her definition of public kinship care included only children in State custody placed in foster care with kin. Child welfare agencies have long used relatives as resources, but States have only recently developed programs specifically designed to ensure their involvement in case planning. These data include public kinship care families that did not identify themselves as foster families in responding to the survey. In 1998, approximately 4.0 million children lived in households maintained by their grandparents; 1.4 million children were living with grandparents without either parent present (U.S. Census, 1999). Data are provided based on two- or three-year averages, because the number of children in kinship care in a single year’s Current Population Survey is relatively small and provides unreliable estimates. In addition, because of the introduction of improved collection and processing procedures, data before 1994 are not comparable to data from later years. Based on yearly March Current Population Survey data, the number of children in kinship care decreased from an average of 2.21 million to 2.08 million between 1994–1996 and 1996–1998, and the average prevalence of kinship care decreased from 3.15 percent to 2.93 percent. Based on data from the Urban Institute’s National Survey of America’s Families, which identified children as living with related foster parents if a foster parent indicated that he or she was related to the foster child or a relative indicated that the child in his or her care was a foster child. In the first type of identification, the caregiver was identified as the child’s foster parent or as the child’s parent and, when probed about the type of parent, indicated that he or she was a foster parent. The caregiver was then identified as being related to the child. In the second type of identification, the caregiver was identified as the child’s brother, sister, grandparent, aunt, uncle, cousin, great-grandparent, great-aunt, or great-uncle, and the child was then identified as being the foster child of this relative. NSAF was completed by a nationally representative sample of approximately 48,000 households in the United States in 1997. Respondents who noted that they were related to, but not the parent of, a child in their household and that neither of the child’s parents were in the home were asked whether they were the child’s foster parent. If they answered no, they were asked whether a social services agency helped arrange for the child to live in the respondent’s home. Those who answered yes are considered to be voluntarily caring for children reported as abused or neglected. Between 1988 and 1993, public kinship care as a percent of all foster care rose from 32 to 54 percent in Illinois, from 22 to 45 percent in California, and from 23 to 36 percent in New York (Harden et al., 1996). However, between 1993 and 1997, public kinship care decreased in New York, from 36 to 26 percent of the foster care caseload, and Illinois, from 54 to 51 percent. During the same period, California’s use of relatives as foster parents increased slightly, from 45 to 47 percent. Miller v. Youakim, 440 U.S. 125 (1979). Lipscomb v. Simmons, 962 F. 2d 1374 (9th Cir. 1992). 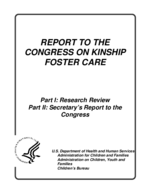 The Department of Health and Human Services has played a key role in promoting public kinship care research, including the funding of analyses of data collected as part of the National Study of Protective, Preventive, and Reunification Services, data that States provide through the Adoption and Foster Care Analysis and Reporting System, and data collected as part of the National Study of Outcomes of Children Placed in Foster Care with Relatives. Parents could receive child-only payments if they themselves were not eligible for assistance—for example, because they were an undocumented immigrant, received Supplemental Security Income benefits instead of AFDC, or had been sanctioned from the AFDC program. The House bill originally referred specifically to “relatives,” but this language was removed from the final version of the law (Spar, 1993). Social Security Act, Section 471(a)(10). A recent California court interpreted the Federal law differently, stating that IV-E eligibility is determined on the income of the caregiver, not the income of the home from which the child was removed (Land v. Anderson). Only Maine and Vermont reported not giving preference to kin, though two additional States noted that relatives only sometimes receive preference, depending on the specific circumstances of the case, and one State noted that preference practices vary by county. Many kin are not eligible to receive Federal funds because they are unable to meet or not interested in meeting traditional foster home licensing standards or they care for non-IV-E-eligible children. As discussed below, States vary in how many of these different licensing categories they offer to kin. In Michigan, counties decide whether or not to allow kin caring for non-IV-E-eligible children to be fully licensed. In 1996, TANF replaced AFDC as the primary federal income assistance program for low-income families. Nine of the 10 states that allow modified kinship care provide foster care payments to kin. Of the 18 States that allow approved kinship care, 10 provide foster care payments to kin, two provide foster care for IV-E-eligible kin, and two provide an alternative rate greater than AFDC but less than foster care. Among the 24 States that allow assisted kinship care, only one provides a foster care payment to kin, and three provide an alternative rate greater than AFDC but less than foster care. Data from an annual benefit survey by the Congressional Research Service (CRS) and from Urban Institute tabulations of AFDC State plan information. Faith Mullen, Senior Policy Analyst, Public Policy Institute, American Association of Retired Persons, February 19, 1999, personal communication. Private arrangements may occur as a result of parental abuse or neglect that is unknown to the child welfare agency; many researchers have suggested that this is a common reason for private kinship care (Casper and Bryson, 1998; Chalfie, 1994). Data on public kinship care families presented in this report do not include non-custodial kinship care arrangements and may not include all custodial arrangements, depending upon States’ reporting practices and the scope of specific studies summarized. See Chapter 5 for a detailed discussion of data limitations. There are no significant differences between children in public kinship and non-kin foster care in gender proportions or number of siblings (Beeman et al., 1996; Berrick et al., 1994; Dubowitz et al., 1993; Geen and Clark, 1999; Harden et al., 1997; Iglehart, 1994; Le Prohn and Pecora, 1994). Most kinship caregivers are maternal relatives of the child in care (Gleeson et al., 1995; Le Prohn, 1994; Link, 1996), and most caregivers that are not grandmothers are aunts (Dubowitz, 1990; Dubowitz et al., 1993; Geen and Clark, 1999; Harden et al., 1997; Le Prohn and Pecora, 1994; Testa and Rolock, 1999). Another study estimated that approximately 45 percent of children in private kinship care are African American (Harden et al., 1997). According to one study, approximately 62 percent of public kinship caregivers and 44 percent of non-kin foster parents are African American (Chipungu et al., 1998). Data on other ethnic groups are not available. There is only one adult in 37 percent and two adults in 44 percent of public kinship homes, compared to 26 percent and 51 percent in non-kin foster homes. Public kinship caregivers are much more likely to care for only one child (22 percent versus 8 percent), while non-kin foster parents are more likely to care for five or more children (40 percent versus 19 percent). This includes both children regularly staying in the home (biological or adoptive children) as well as children in kinship or foster care (Chipungu et al., 1998). Two small-scale studies also found that public kinship caregivers are more likely to live in public housing (Berrick et al., 1994; Le Prohn, 1994). One study found that a slightly higher percentage of non-kin foster parents than public kinship caregivers were unemployed (31 percent versus 26 percent) even though kin caregivers are more likely than non-kin providers to be retired (15 percent versus 12 percent) (Chipungu et al., 1998). However, it is important to remember that estimates of unemployment among kinship and non-kin caregivers do not provide a complete picture of family employment status. While a caregiver may be unemployed, a spouse may be working full- or part-time. Further, while only 3 percent of private kinship care providers are unemployed, 39 percent are not in the labor force (Harden et al., 1997). Data show that public kinship caregivers are more likely than non-kin foster parents to be in unskilled (8.6 versus 4.7 percent), semi-skilled (15.2 versus 12.3 percent), and clerical/technical (14.3 versus 9.7 percent) fields (Chipungu et al., 1998). Child welfare workers interviewed in another study reported that their case management practices are the same for kin and non-kin families (Chipungu, 1998). Yet even this study presents conflicting findings. Interviews with caregivers showed that on the one hand kinship care families have less frequent contact with social workers than non-kin foster care families, and on the other hand that caseworker records indicate no differences in the frequency of worker contacts with children in the two types of foster care families. While data are limited, it appears that children in private kinship care remain in care for long periods as well. One report found that over half of grandparents with primary caregiving responsibility cared for the child for at least 3 years, and 41 percent cared for the child more than 5 years (Fuller-Thomson, Minkler, and Driver, 1997). Similarly, different studies summarized in this report are based on different segments of the public kinship care population.